The San Bernardino County Sheriff’s Department, in cooperation with Barstow, Chino, Colton, Fontana, Montclair, Ontario, Redlands, Rialto, San Bernardino and Upland police departments, will have its first countywide gun buyback tomorrow (June 1). The event, which will take place from 10 a.m. to 5 p.m., is similar to a highly successful event conducted in December 2010 by the San Bernardino Police Department. OK, so lots of folks are eagerly anticipating the Slater’s 50/50 opening up in Victoria Gardens, but that’s not the only new restaurant in town. 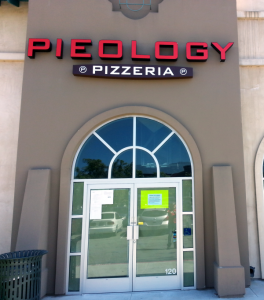 Catty-corner from Slater’s, at 8158 Day Creek Blvd., Suite 120, will be Pieology. Its assembly line ordering is what sets Pieology apart from the other pizza joints out there. Chow Phở has opened recently in the space previously occupied by El Gran Burrito and Amapola Rico Taco at 1060 Harriman Place. According to Yelp reviews, the restaurant features a variety of Asian dishes, starting with Vietnamese (obviously) and including Thai and Chinese cuisines. You can check out the disparate reviews (one five-star, one one-star) here. Upland’s Rockin’ Pizza Pub is hosting a fundraiser tomorrow (May 30) for Route 66 IECA, a non-profit organization that seeks to preserve historically significant landmarks, promote international tourism and promote businesses along Route 66, specifically in the Inland Empire. The restaurant will donate a portion of sales from 11 a.m. to 8 p.m. to the organization, earmarked for the restoration of the Cucamonga Service Station. Rockin’ Pizza Pub is at 1490 E. Foothill Blvd., Suite D, Upland. It appears that Stater Bros. Markets is the latest to roll out the Coca-Cola Freestyle. We’ve been following the propagation of the high-tech, 100-plus choice soda fountains since first experiencing one back in the summer of 2009. We’ve seen them deployed at chains, like Boston Market, Five Guys and Burger King, as well as several independent restaurants, like Surfer Joe’s and Zorba’s Burgers. This is the first time we’ve seen them in a grocery store. The RA Sushi chain (which has locations in Chino Hills and Corona) is gearing up once again for its Nicky’s Week fundraiser, which runs Sunday (May 26) through Saturday, June 1. 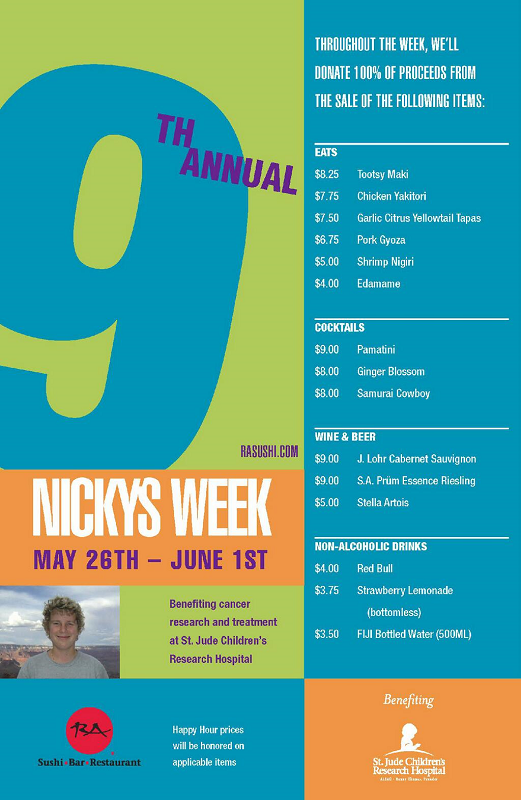 The campaign raises funds for cancer research and treatment at St. Jude’s Children’s Research Hospital. The chain will generously donate 100% of proceeds from the sales of select food and beverage items to St. Jude’s. Head over the jump for a full list. OK, so it’s not going to be scorching in the Inland Empire this Memorial Day weekend, but 7-Eleven stores are still going to offer you a cheap way to cool down. The ubiquitous convenience store chain will be selling medium Slurpees for just 49¢ today (May 24) through Monday (May 27) at participating locations. Just try not to get brain freeze. We like tapas, and we especially like free. If you feel the same, here’s all you need to do to get a free tapas platter at Cafe Sevilla in Riverside.